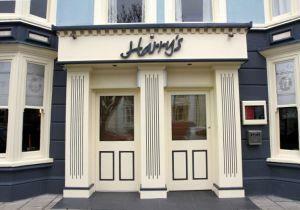 Harry's Hotel, Bar & Bistro01970 612647work HotelHarry’s has a range of rooms from singles to deluxe rooms, which will suit all types of travellers. The staff and management in Harry’s look to achieve a friendly, relaxed and warm environment that will bring customers back again. A residence with a sense of elegance and warmth. Harry’s is conveniently located in the heart of Aberystwyth.It is located near the waterfront, train station and shopping centre; Harry’s is an ideal choice for any visit, with friends or family. Harry’s has a range of rooms from singles to deluxe rooms, which will suit all types of travellers. The staff and management in Harry’s look to achieve a friendly, relaxed and warm environment that will bring customers back again. With the hotels convenient position just off the High Street, which is only a 2-minute walk from Cardigan Bay seafront, it can be said that it is unsurprising that the hotel’s surroundings are seen as an area of outstanding natural beauty. The hotel is within easy walking distance of all of the town’s attractions, amenities and facilities. The nearby university and library lend an intellectual and cultural aspect to your stay. The university helps the town ensure it has a vibrant feeling throughout the year and not just during summertime. Harry’s Hotel will be happy to help with details and information regarding local attractions and what to see and do in the area. Children welcome from any age.